Pakistan Telecommunication Company Ltd (PTCL) has revamped its broadband entertainment portal, PTCL BUZZ. Only PTCL Broadband Subscribers can access this portal. The portal has been upgraded is now a more image-driven website. 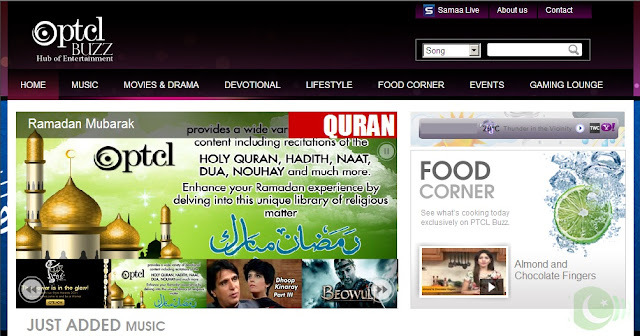 With an aesthetic layout and logically marked sections, enriched content and increased genres, PTCL Buzz that is one of the largest Pakistani entertainment portal offering legal content. Successfully created a fiesta for eyes in addition to this the navigation has been significantly simplified. The background has been replaced with some ultra vibrant and catchy Movie Themes which are updated frequently keeping the viewers constantly involved. Exploration of movies, music, and dramas has been reworked for the customers, making it easier to navigate and pleasant for the viewer. Inclusion of Food Corner, Devotional section, events and lifestyle makes sure that the portal provides a wide range of content to its visitors. “PTCL has the unique status in Pakistan of providing broadband services in over 1000 cities across the country to over 600,000 customers, it has been instrumental in making quality service available to general public across the country, through hugely investing in expansion and extension of its services”. “PTCL Buzz is one of the most popular broadband entertainment portals in Pakistan. It receives over 300,000 visits every month which is very good considering the fact that the portal is exclusive to PTCL BB subscribers”. “PTCL is spearheading the expansion of Broadband culture in Pakistan, where till a few years back there was little awareness in the market about the broadband and multimedia technologies”. “PTCL has always been the first to introduce and provide the benefits of latest technologies to the customers”.